While attending a National Fishing Lure Collector Club (NFLCC) regional show in Bakersfield, California, my good friend Mike stopped me while room trading and tells me there's a fishing lure in one of the rooms that has my name on it! 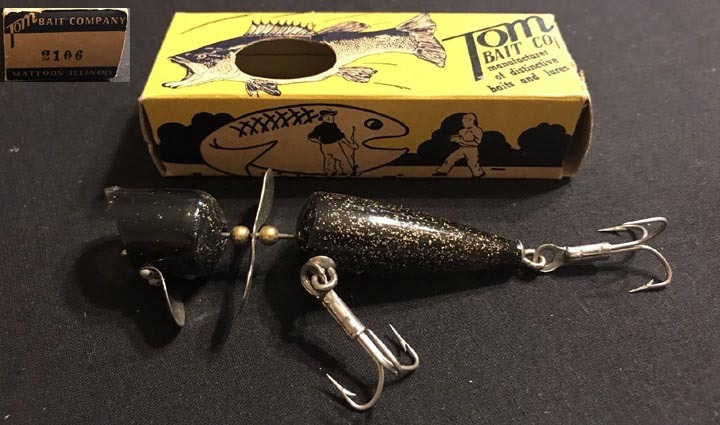 So off we go to the room and sure enough, we find a lure in a box made by the Tom Bait Company of Mattoon, Illinois. Well, since my name is "Tom", this was a 'must' purchase. At the time, I didn't make another connection I had with this company, namely that a couple my wife and I knew, had lived and worked in Mattoon, Illinois for most of their lives until they retired and moved to Arizona! As Mattoon is a fairly small town, they personally knew the company founder, Tom Messick as I later found out when showing them my prize! 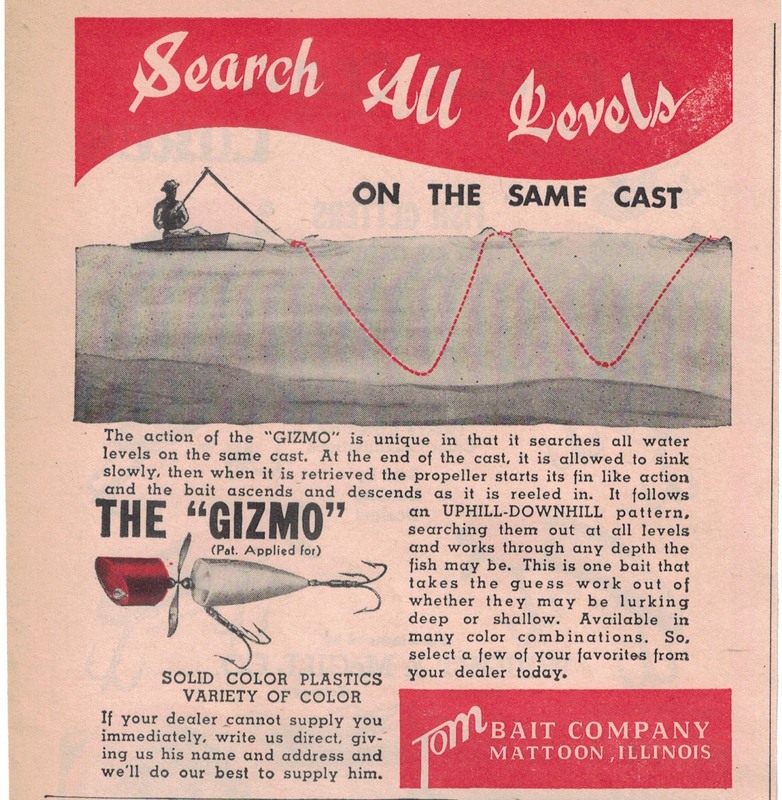 Messick started the Tom Bait Company in the late 1940's, and advertisements as well as the box papers show that the company produced 2 lures, the "Gizmo" and the "Shineroo". 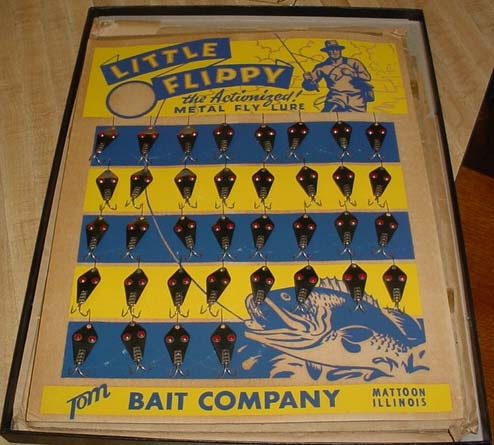 The Gizmo is a solid plastic bait with the color part of the plastic. It measures 3-1/4" in length, has a spinner blade between the front and back sections, eye screw belly hardware, and is marked in raised letters on the top of the back section, "GIZMO". 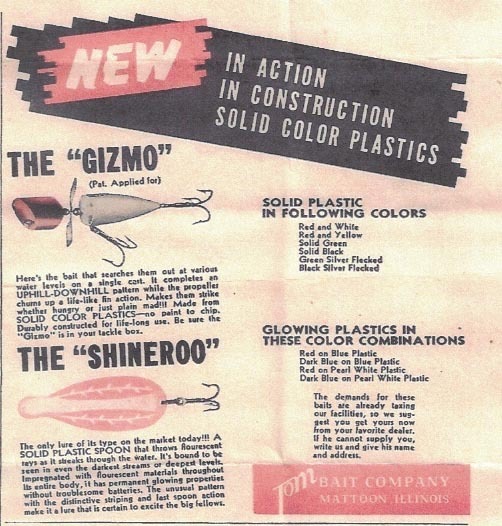 It came in a very colorful box that included a fold-out six section box paper that detailed fishing instructions and advertising for both the Gizmo and Shineroo lures. 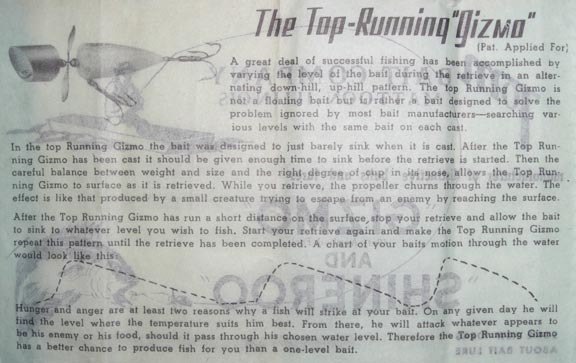 Though generally not mentioned in the advertisements, the box paper indicates that it was made in both a "top running" version and a "mid-running" version. Based on the illustration of the lure in the box paper, the difference between the two was the position of the cup slant in the head - note that the 'top-running' faces down while the 'mid-running faces up. 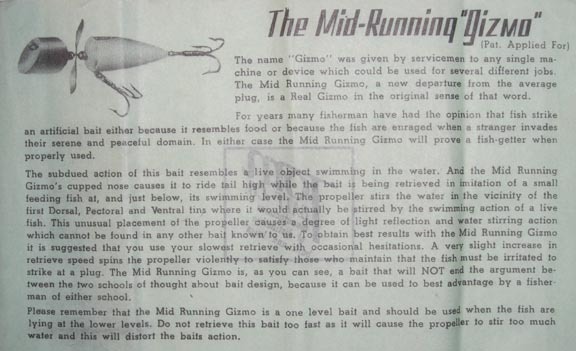 At some point in time, a 3rd variation of the Gizmo was added to the line and it was also called the "Top-Running" Gizmo. This variation has an added diving lip on the head and the body shape of the back section is less 'pointed' and measures approximately 1/4" in diameter as compared to 1/8" of the other version. Two other differences are notable between the two - the version without the diving lip has a 'flat' area on the front of the tail section where the name appears; the lipped version lacks the flat section and is also marked GIZMO TOP-RUNNING. To add to the history of the Gizmo lure, a 4th and unadvertised variation exists, a weedless hardware version. 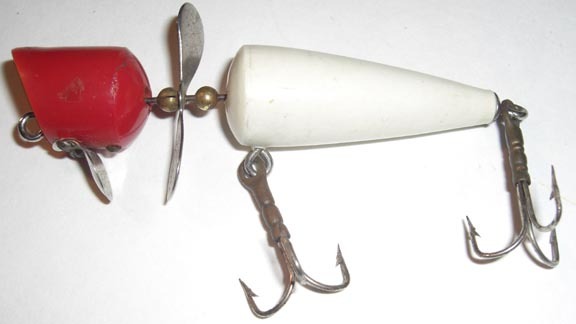 It has the same body and configuration as the Top-Running Gizmo with the diving lip, except the belly hook has been replaced with a double hook with wire weed guards and the tail hook replaced with a spinner blade. It is marked on the top of the back section GIZMO and the box is marked G-WG-BY which stands for GIZMO-WEED GUARD-BLACK/YELLOW. 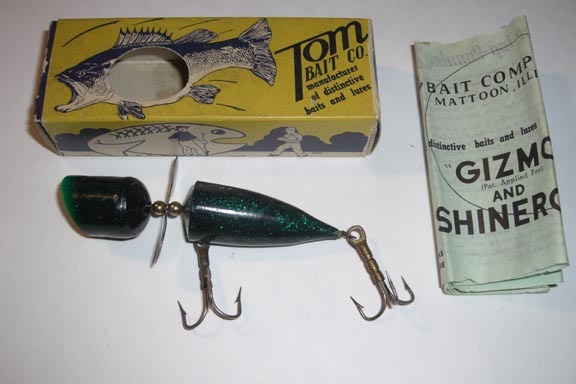 The other lure made by the Tom Bait Company was a plastic spoon lure called the "Shineroo" which was patented, number D152,636. It measures 3-3/4" in length, has a single treble tail hook and is marked on the top in raised letters SHINEROO. 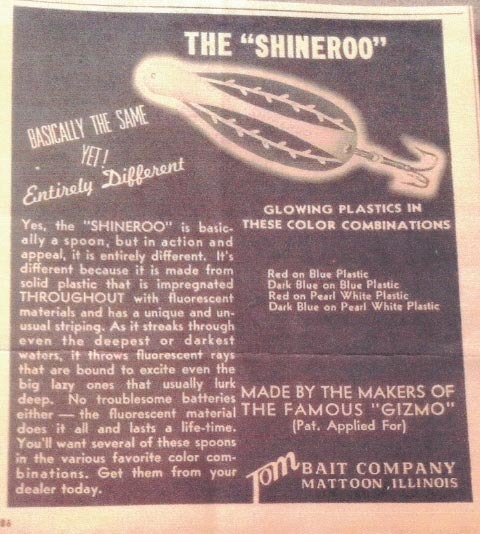 According to the advertisement, it is "A solid plastic spoon that throws fluorescent rays as it streaks through the water..." and is "...impregnated with fluorescent materials...", this making this a luminous type lure. A bit of testing showed that when exposed a bright light source, it indeed glowed in a dark environment. It was advertised in 4 colors, Red on Blue Plastic, Dark Blue on Blue Plastic, Red on Pearl White Plastic and Dark Blue on Pearl White Plastic. (Note: The 'dark blue' appears black in all but natural light in which case, it is a very dark blue; the 'blue' as shown in the Shineroo above in red looks gray in all light). 1Robert A. Slade, The Encyclopedia of Old Fishing Lures Made in North America, Volume 17 (Bloomington: Trafford Publishing, 2011), p. 250. 2Ibid, Volume 10, p. 64. 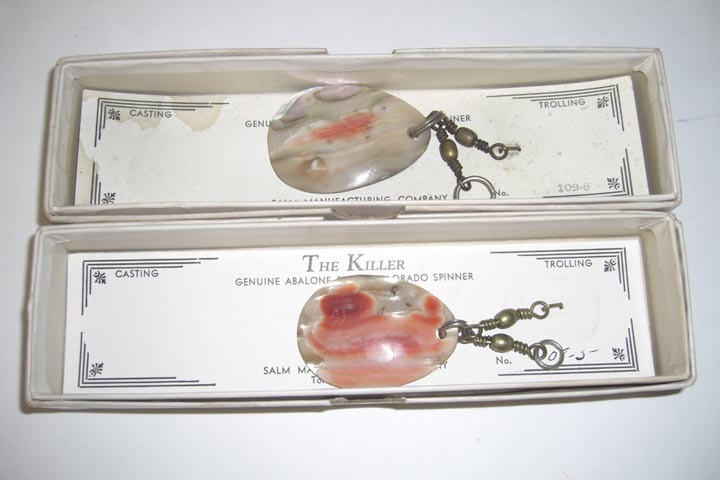 The Killer Genuine Abalone Pearl Colorado Spinner was made in the mid to late 1930's by the Salm Manufacturing Company of Torrance, California. 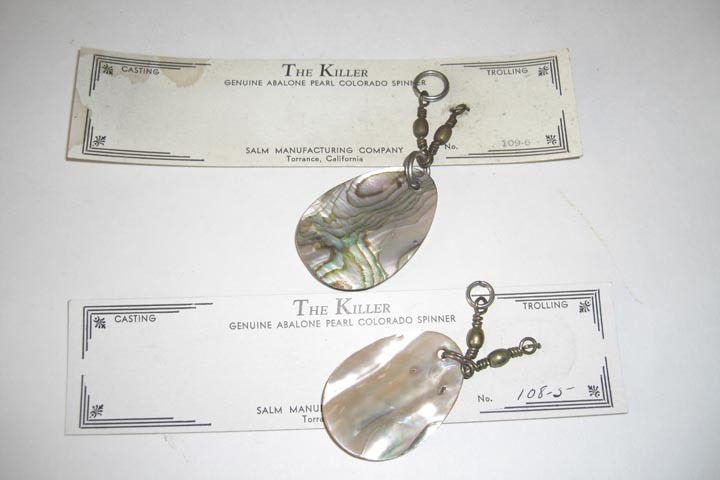 "The Killer" was a trade name for their lures and they made a number of lures from red abalone pearl shell including metal spoons with a shell side. The Colorado spinners came in a couple of different blade sizes and can be found on card both with or without a single treble hook. A split ring on one end allowed for attaching whatever size hook desired. These came in a plain white box that is marked on the side with the model number which also appeared on the card, i.e., 108-5, 109-6, etc. If you have any further information on any of the items displayed on this page which you'd like to share, please send your comments to me and I'll update the page accordingly. Contributions of interesting items and/or unknowns are encouraged. Lures pictured in Lure Lore are not for sale.